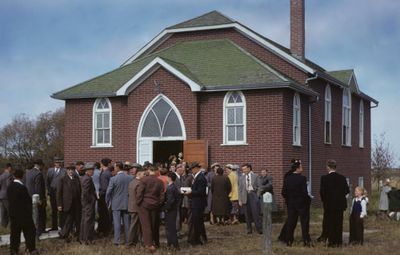 Boissevain Mennonite Brethren Church, 1951. The Boissevain Mennonite Brethren Church was initiated by a group of immigrants from Russia, who settled in southwestern Manitoba, and held services in private homes. Soon those homes became too small and the services were moved, in 1925, to a small church in Whitewater. Thus the congregation was originally called Whitewater Mennonite Brethren Church. Because of travel difficulties, special occasions such as communion or visiting preachers became all day sessions where people brought their own food and enjoyed the day of fellowship. The congregational formally organized in 1928. In 1930, the congregation began to meet in a school. In 1940, the church in Margaret disbanded and joined the Whitewater MB Church. The congregation was active in supporting refugees during World War II. Church membership increased and a new church site was chosen in Boissevain. The church was officially dedicated 26 November 1944 with the new name Boissevain Mennonite Brethren Church. Another building was built in 1966, with a subsequent project in 1944. David D. Derksen was the founding leader of the congregation; he asked to be relieved from leadership in 1957 and A. J. Froese took his place. The language of worship is English; the language transition from German occurred in the 1960s. Canadian Mennonite (27 November 1953): 1. Mennonite Brethren Herald (27 May 1988): 37; (31 May 1991); (23 July 2004); (January 2012); (December 2013): 25. Address: Box 508, Boissevain, Manitoba. The church is located at 700 Aikman Street. Dyck, F. K. and Marlene Epp. "Boissevain Mennonite Brethren Church (Boissevain, Manitoba, Canada)." Global Anabaptist Mennonite Encyclopedia Online. February 2014. Web. 21 Apr 2019. http://gameo.org/index.php?title=Boissevain_Mennonite_Brethren_Church_(Boissevain,_Manitoba,_Canada)&oldid=146953. Dyck, F. K. and Marlene Epp. (February 2014). Boissevain Mennonite Brethren Church (Boissevain, Manitoba, Canada). Global Anabaptist Mennonite Encyclopedia Online. Retrieved 21 April 2019, from http://gameo.org/index.php?title=Boissevain_Mennonite_Brethren_Church_(Boissevain,_Manitoba,_Canada)&oldid=146953.